LotusTalk - The Lotus Cars Community > Lotus Discussions > Lotus Esprit > Is this a lost cause? What would be involved in fixing this? I am not interested in the project at this point but I was curious what others that have done this type of work think. On the surface it seems like disassembly and some fiberglass work and paint. Nice driver! Would the structural integrity of the front end ever be OK with out a ridiculous effort? Fiberglass is deceptively good at not indicating the true amount of energy absorbed in a crash. My late 88 below may look like fiberglass work but upon close inspection you can see an enormous amount of energy was transmitted to the bolted on chassis. too high. That eBay car - the crack I see on top of the fender - tells me the chassis or suspension took a big hit. And you can’t safely bend/stretch galvanized back bone. Nothing is a lost cause. Just depends on how much you want to spend. The wheels look to be undamaged, which is a good indication that the suspension mounts are ok. I don't see much deranged in the front compartment, but the photo is not the best. There could be a tweak to the cowl intake on the passenger side, but I can't tell. The real indication would be to request a photo with the spare removed and a shot of the bolt heads for the front crossmember. That and a picture of the frame from underneath. If nothing else, there are a LOT of nice parts on that car. Ok - looked at the rest of the photos - there is clearly some significant damage to the floor of the front compartment on the passenger side. I would suspect that there is some damage to the frame. The left rear corner of the body is sitting pretty high above the wheel, which is not a good sign either. I would want to see some photos from underneath with the front wheels removed and the trailing arm mounts for the rear suspension before making an offer. Last edited by mike.griese; 04-13-2019 at 05:12 AM. The problem here is not only the cost of repair. You must factor in the "diminished value" of the car because of the accident and the salvage Title. When you do that, the cost of acquiring the car plus the repair will greatly exceed what the vehicle will be worth after you are all done. In many States it is a big deal to "fix" a salvage Title. After buying the car and spending all of the money on the repair you might not get the Title fixed. It is a gamble. I saved a wrecked V-8 and it didn't have a salvage Title but it did have the accident on Carfax. Let's just say the car was fixed but financially it did not end well for me. Also keep in mind it can be challenging finding all of the parts you will need. Bottom line, RUN don't walk away from an old Lotus that has been in an accident unless the car is special in some respect, like it was in a movie or owned by a celebrity. Good points, if I were purchasing a salvage title V8 I would not be comfortable spending more than $20K on a car that was already repaired to a decent standard (would not be looking for concours). This one is already priced that high. It is scary, I see used sports cars for sale all the time where the title has been "washed" some how and the only reason we know its salvage is because the seller is being up front about it. Seems like this would have to be priced at half their asking price to even begin the discussion on whether to take it on with that level of damage. Says its a 22K mile car. What is something like this worth as a parts car? The used parts market does not seem to be that "hot" from my observations. Maybe part for $15K pretty quick and more if you had space and time to wait and sell off the smaller bits? The car is a Lotus! Likes there's some kind of equivalency? In the final analysis it's only electrons. Years from now I will not regret spending hoards of electrons on a car that has virtually no peer. FWIW - my late 88 Esprit - parted out by 'slava81' in 2015 - still have a sill and a few bits hanging around in 2019. 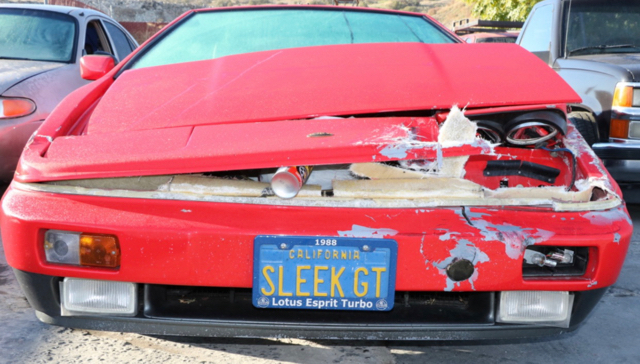 Parting out a low volume Esprit means even smaller market of people needing parts. IMHO I have a hard time believing parting out an Esprit of any model will be a significant money maker - you do it because you need some key component and sell the rest to reduce your loss/investment on non-essential parts.